The 2014 T-REX was developed for a new breed of riders focusing onaerial tricks and fun, poppy changes in direction. This unique, progressiveshape is trending in the surf industry with the top pro riders. 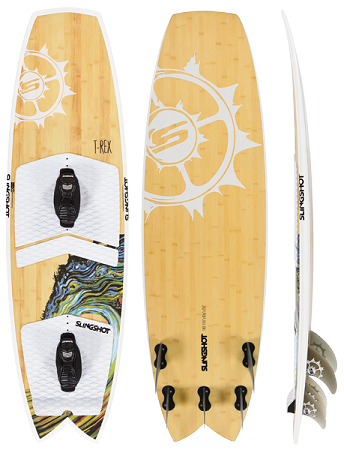 Patrick Rebstockprefers this next generation surf shape because it makes it easierto spin and flip tricks with less swing weight and has a tight precise feelto blast upwind. Everyday riders will love the shape because it makes iteasier to catch waves by reducing the tendency of pearling as you dropinto your line. Once you’re in the wave, the aggressive 5 fin setup givesyou more drive and acceleration without working as hard as a quad or trifin setup. This unique setup also gives you the option of configuring the fins how you want. Ride it as a tri for a more free, skate feel or as a quad ifyou’re looking to track more. The new T-REX is the perfect travel board. The shorter sizes make it easyto take with you to your favorite wave destination and fits in a widervariety of travel bags. Each of the sizes ride like a larger board withoutthe weight and hassle. The single concave makes the board ride super precise, but forgiving for all levels of rider. The tail shape allows for sharpcarving in any type of condition. Our entire line of surf boards features art by progressive surfer andartist Phil Goodrich. ENTRY LEVEL TO ADVANCED SURF STYLE: Riders looking for a high performance boards that it is super fast and user knowledgeable. Ideal for the small to over-head surf and it can be ridden with or without straps. Each board includes our New Symmetrical Surf Straps with super cushy ergonomic EVA wrapped in a Neoprene cover. These straps feature a quick and easy buckle system. No more Velcro! This system fits a wider variety of foot sizes and will definitely add some style to your riding. The package also includes our pre-installed EVA Surf Pads and high quality Fiberglass Fins. Aggressive 5 fin setup: 3 x 3 5/8” tri + 2x 4 5/8” Asymmetrical sides. FCS Compatible Fin Boxes. Polyester w/ smoke tint fins. Fluid X was born from the ski and snowboard industry. It made sense to look toward progressive snow sports technology to provide state of the art dampening control to reduce vibration and create a clean and smooth feel throughout all our high performance boards. Fluid X also provides an anti-torsion property that runs from tip to tail and it’s visco-elastic stringer improves the dynamic behavior of the core construction that allows more flex, more response and the smoothest feel unlike anything you've experienced on a kite surfboard. With Fluid X, we finally managed to give our boards a polyester feel with the durability of an epoxy lay up.